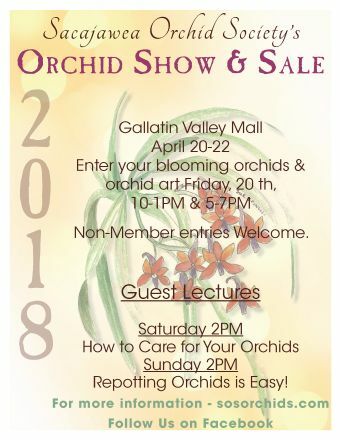 This year's show was in front of Macy's in the Gallatin Valley Mall, where we get lots of people walking through and enjoying the beauty of our lush display. Plants were judged by seven American Orchid Society (AOS) judges from Oregon, Utah, and Colorado. Judging teams were composed of AOS judges plus local SOS members and interested community members. Also judged were entries of orchid related art in various media with ribbons or rosettes awarded. On Friday April 20, we registered 97 plants and 15 pieces of orchid art from a total of 27 exhibitors. On Saturday April 21, we held the ribbon show. A lot of people went home with awarded ribbons or rosettes. Engraved brass plaques were awarded for 'Best of Show' and for 'Best Grown'. Two plants won national AOS (American Orchid Society) awards. On Sunday April 22, the winners of a silent auction for were drawn. This year's auction include 3 beautiful orchid plants in full bloom. We were also very lucky to be able to host two vendors of orchid plants, and one vendor of orchid art. Charlie Spinelli's Greenhouse from Amsterdam came with very interesting orchid plants. They manage to have new choices of plants each year, and they are deeply knowledgeable about their orchids. Jolah Orchids from Oregon came offering numerous gorgeous orchid plants. Sue Spinelli was displaying and selling botanical art work in various media at the same booth as Charlie Spinelli's.